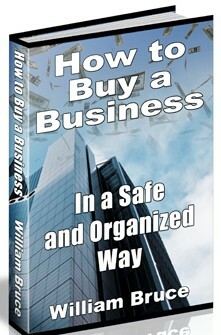 "How to Buy a Business in a Safe & Organized Way"
What type and size business is right for me? How do I find the right business? Why would a good business be for sale? Where can I get the money to buy a business? How do I analyze a business? How do I determine what a business is worth? What's involved in closing the transaction? or by email from this website. Email William Bruce for your free copy of this 62-page booklet. Email William Bruce for your free copy.